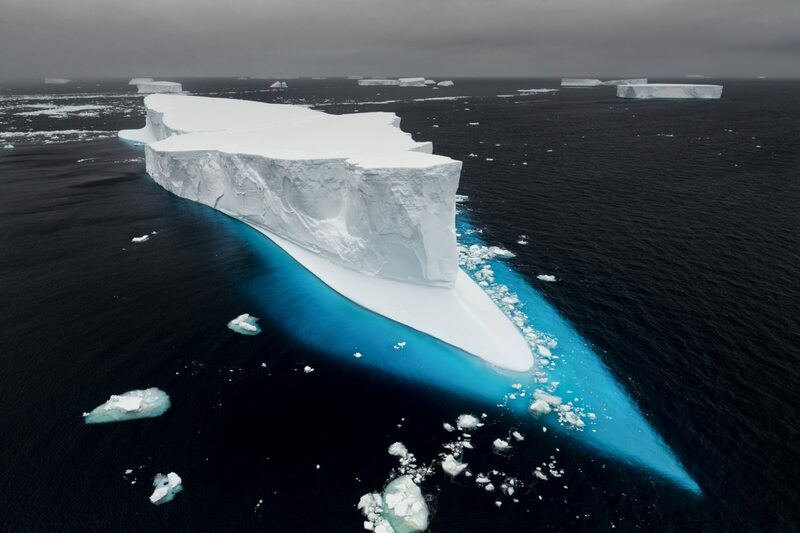 “‘Nature’s Masterpiece.’ Tabular icebergs come in all shapes and sizes.” Photograph © Paul Nicklen. All rights reserved. Location: Antarctic Sound, Antarctica. “‘The Hunter.’ This image is a study in patience at the edge of the sea. I waited on the ice as the Arctic sun dipped below the horizon, and the molten gold of sunset saturated the twilight. 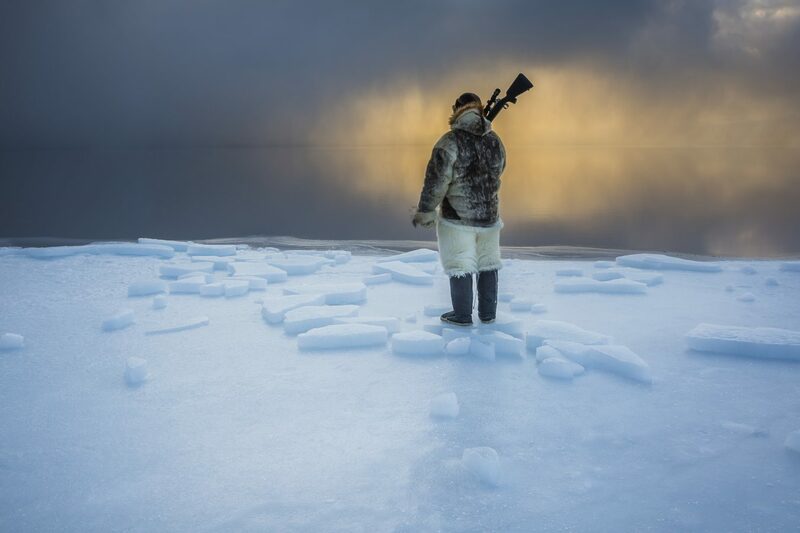 Knowing that his dogs and his village depend on his aim, Naimanngitsoq Kristiansen, a traditional Inuit hunter, also kept his patient watch, waiting for harp seals or walrus to come near.” Photograph © Cristina Mittermeier. All rights reserved. Location: Thule, Greenland, 2015. 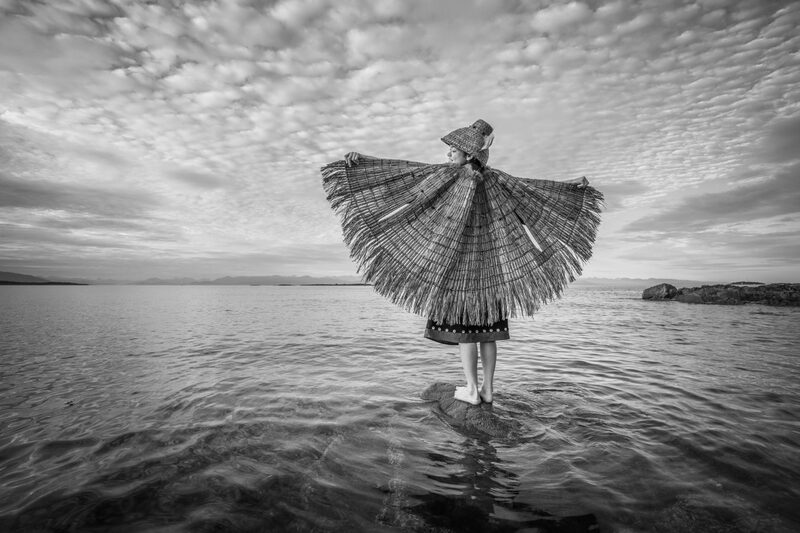 “‘With Open Arms.’ Ta’Kaiya Blaney, a singer, songwriter, drummer and advocate for her people, the Tla’amin First Nation of British Columbia, is culturally connected to the power of the Salish Sea.” Photograph © Cristina Mittermeier. All rights reserved. Location: Vancouver Isalnd, British Columbia, Canada. “‘Egg Yolk Jelly.’ Like ghostly apparitions, other mysterious ‘jellies’ seem to come out of the deep and disappear just as inexplicably. I imagined this image long before I took it. During our summer explorations, I took every opportunity to swim with jellies. Straining to keep up with the current and hoping that the jelly wouldn’t sink, I waited for the lacy tail of the jelly fish to extend fully as we drifted along the surface. 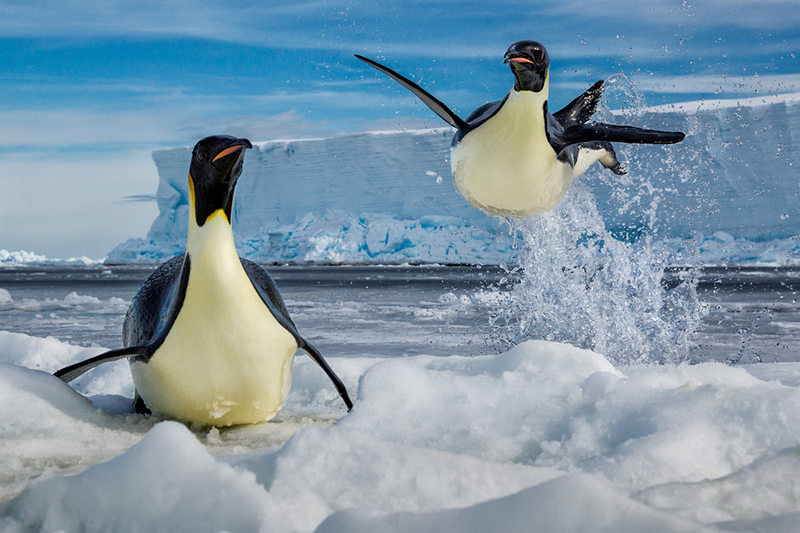 I swiped the bubbles from the camera’s domed surface, pulled the trigger, and immortalized the photo I had first imagined months before.” Photograph © Cristina Mittermeier. All rights reserved. 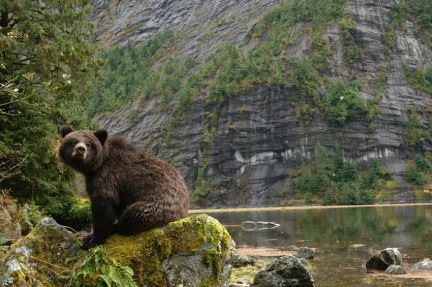 Location: Great Bear Rainforest, British Columbia, Canada. “‘Leap of Faith.’ Emperor penguins release millions of micro-bubbles from their feathers allowing them to increase speed as they exit the cold Ross Sea and return to their chicks.” Photograph © Paul Nicklen. All rights reserved. Location: Ross Sea, Antarctica. 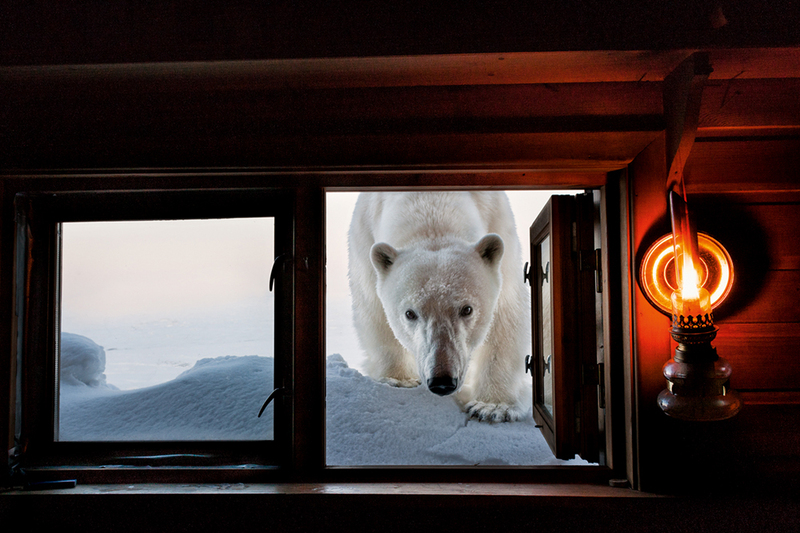 “‘Face to Face.’ While waiting out a blizzard, this bear was peeking through the window of Paul’s tiny cabin in Svalbard, Norway. He opened the window and, face to face, she found his camera and smile of gratitude looking back at her.” Photograph © Paul Nicklen. All rights reserved. Location: Svalbard, Norway. 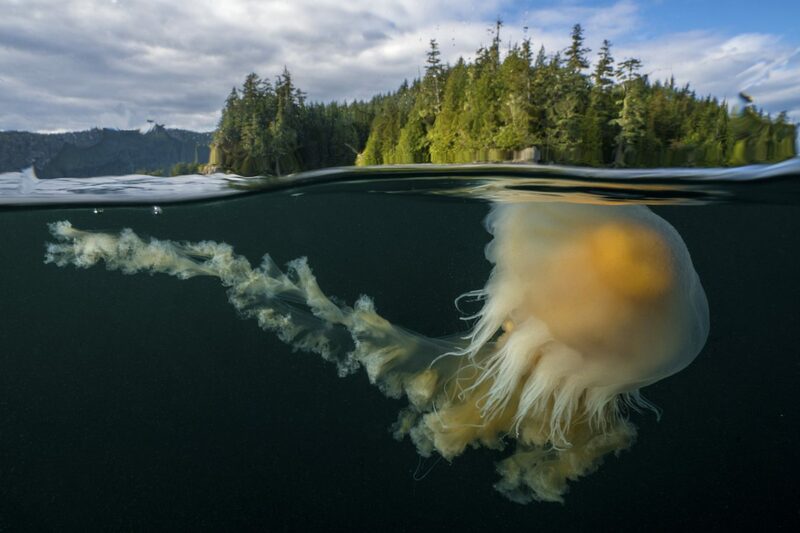 In 2014, after about two decades in the field of conservation photography, Paul Nicklen and Cristina Mittermeier reached peak frustration with environmental inaction. Mittermeier was diving in Puget Sound, Washington, when she came face-to-face with a couple of wolf eels that were suffocating due to a mass of warm water known as the Blob. Soon after, Nicklen was leading a tour in Svalbard, Norway, searching for polar bears, when he finally spotted a pair—but they were dead. “I went from being really upset and sad to angry and frustrated. This urgency started to build,” Nicklen says, speaking over the phone from the home he shares with Mittermeier in Nanoose Bay on Vancouver Island, on a rare weekend at basecamp between expeditions. The birth of the organization was announced by Prince Albert of Monaco at the Oceanographic Museum during an exhibition of the couples’ work funded by Taylor Thomson, a member of Canada’s richest family, who had been on the Svalbard tour and was moved by the experience. SeaLegacy has since created a network of influential individuals called the Swell to help share its message; the who’s who of ocean advocates includes Bryan Adams, Lindsey Vonn, and Eddie Vedder. To make the most impact, Nicklen and Mittermeier, both former biologists, look for issues at tipping points that they can amplify with engaging imagery, often working with other conservation organizations and scientists. They then lead teams of photographers and videographers on ambitious ocean expeditions, collecting visual assets with which to craft compelling narratives that grab media attention and inspire action. “We can take these local issues and put them in front of the international court of public opinion and get the world to weigh in,” Mittermeier says. Perhaps the best example of this was in December 2017, when SeaLegacy released a video of a starving polar bear lumbering along the desolate landscape of Somerset Island, Nunavut, searching for food in empty fuel drums. 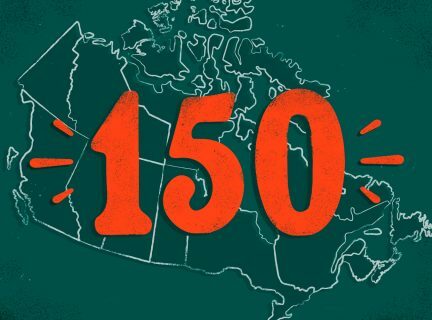 The distressing footage was picked up by more than 300 news organizations around the world, reaching more than two billion people and making it arguably the biggest climate change story of the year. Another big win came when SeaLegacy teamed up with organizations working to ban driftnets in California, the only American state that still allows them. The mile-long nets are used to catch swordfish, but they can also entangle and kill dolphins, sharks, and even whales. Nicklen and his colleagues went underwater to catch images of the carnage, releasing their haunting findings in April 2018. “To say that we upset the world with that footage is an understatement,” he says. In a few days, they had gathered more than 113,000 signatures demanding a ban, and the document was delivered to the California Senate by SeaLegacy’s 14-year-old youth ambassador. In autumn 2018, a bill banning the use of driftnets was signed into law. There are many more issues to tackle. The couple, who were named 2018 National Geographic Adventurers of the Year, have just returned from Adams River in the B.C. Interior, where they were documenting the declining salmon run; and now they’re going back to the Lofoten islands in Norway, home to orcas feeding on herring in the winter, to put pressure on the government to implement a permanent ban on oil and gas exploration in the area. SeaLegacy previously led an Instagram campaign on the issue, which resulted in 12,000 emails being sent to the Norwegian prime minister, who implemented a temporary ban within a few weeks. Amid the big wins, there are small ones, too. 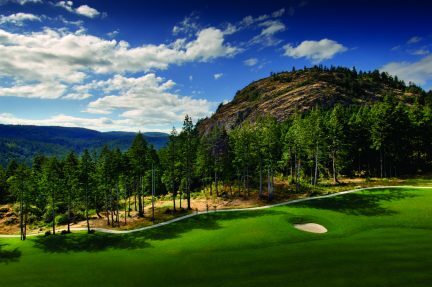 Nicklen and Mittermeier first started working together in 2010 in the Great Bear Rainforest in British Columbia. 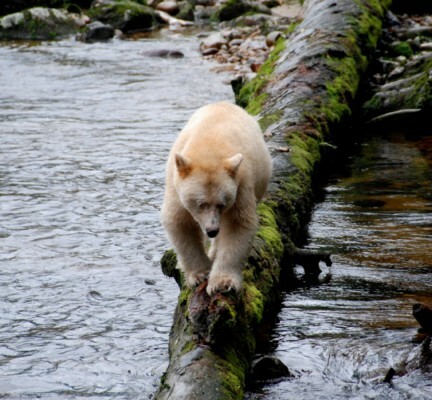 Nicklen was on assignment for National Geographic and was tasked with photographing the elusive white spirit bear, and Mittermeier was working with the International League of Conservation Photographers on a campaign to stop the Northern Gateway Pipeline. As they were leaving the area at the end of their visit, they spotted an old spirit bear that the First Nations communities call ma’a (grandma), and she ended up being a National Geographic cover girl. SeaLegacy recently returned to the Great Bear Rainforest, and Nicklen once again photographed ma’a during an emotional reunion.